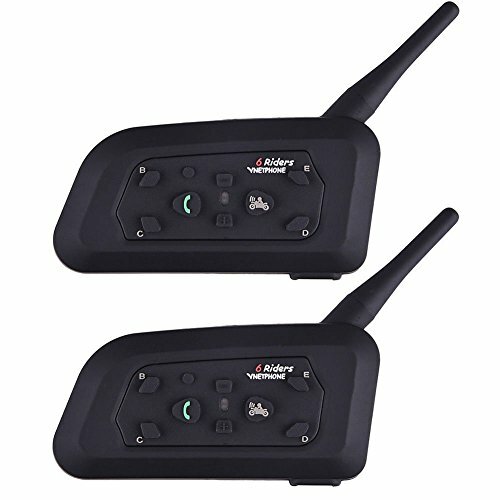 This interphone is designed for the motorcycle riders and passengers who wish to have clear and reliable wireless communication while riding. The headset is compatible with Bluetooth cell phones, GPS, mp3 and suits for almost all sort of helmet for motorcyclists. Digital signal processor(DSP) technology for wind noise cancellation, ensures crystal clear voice at high speed. With 3.5mm audio input, can work with external media play devices, like MP3/portable CD player/iPod and etc. More stable structured button panel shows better waterproof performance. Receive audio navigation message from Bluetooth enabled GPS. Fit all kinds of helmets (open/ full/ half face). Ideal for any motorcycle helmet and skiing helmet. 1.Please install correctly,under raining situation,devices jack down,making sure headphone jack to fully inserted state with devices,to prevent the devices into the water. 2.Please use the standard charger in order to ensure the battery life. 3.Don't recommended to listen to music in the state of riding to ensure the safety of riding. 4.In the riding state,don't manually operate the host button.Pay attention to safety to ensure the communication distance,please try to use in open areas. Two users Full duplex Real-Time communication.This high and mult-interphone system allows up to 6 riders in communication. Full duplex between two riders or rider and pillion 1200m max communication distance on a HD vision route (no obstacles on the way). Works with any Bluetooth equipped ,mobile phone,GPS or MP3 Stereo music etc. Waterproof,Wind noise DSP cancellation.High power,full-duplex talking,no need PPT button,release your hands. Auto-receiving the cellphone call when you are in intercom channel after 5 seconds.Or you can press phone key to hang up. If you have any questions about this product by Eroboo, contact us by completing and submitting the form below. If you are looking for a specif part number, please include it with your message.